i transformed ROSE’S heavenly CAKES: Chocolate Apricot Roll with Lacquer Glaze (page 163), from a roll into a heart. cake rolls are an adorable classic of fine pastry, and i love them! 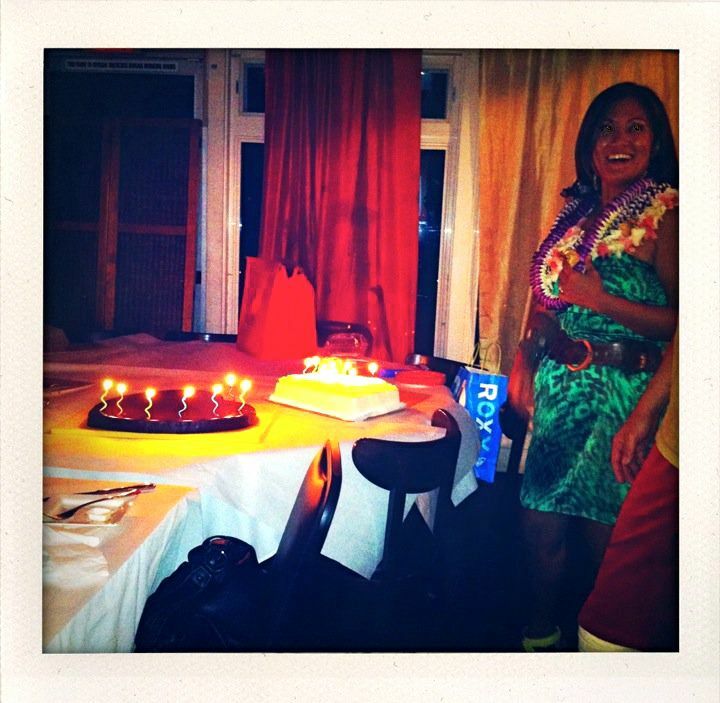 but i reshaped this cake into a heart for my paddling friend toney on her birthday. toney is a 5-star dear friend to everyone paddling. toney always teases me that i shall start making her wedding cake, yet also find her a groom! 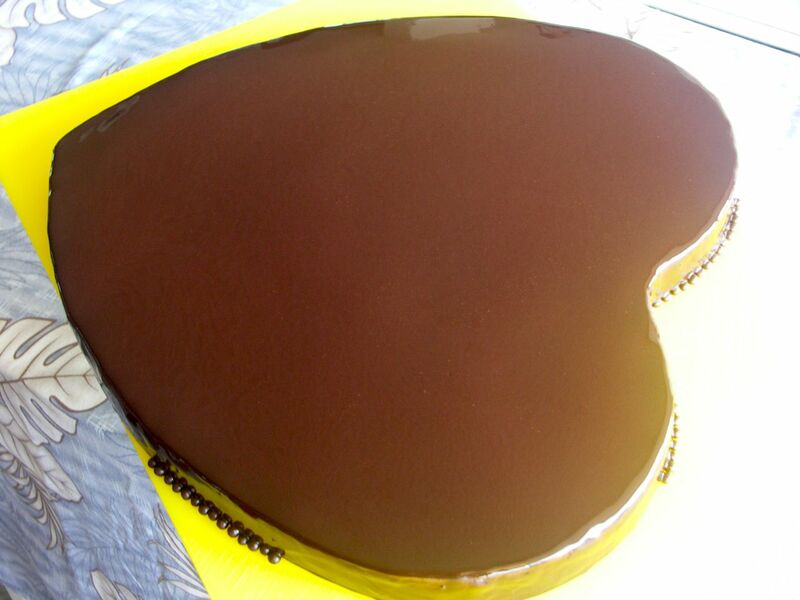 so, i designed this large chocolate black heart for toney’s as a symbol of her big heart and wedding fantasy! i baked the cake on the 16×2-inch wilton heart pan which volume equals to two 11x17x1-inch half sheet pans, so i whipped a 2x batch of biscuit roulade. i know from experience that biscuit cakes bake well at any width. the cake baked flat gorgeous. then, following the proportions of the original chocolate apricot roll recipe, i filled the cake with a 2x batch of apricot jam filling. 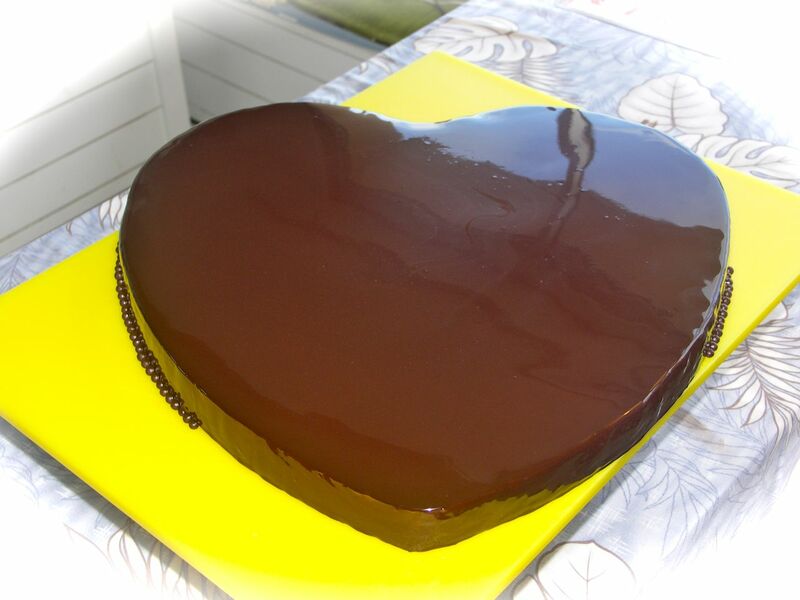 i made a 4x batch of ganache so i could frost the heart to perfection. the cake was assembled a week ahead of time, so no syrup was necessary. the generous amount of ganache made up for any lack of syrup, too. 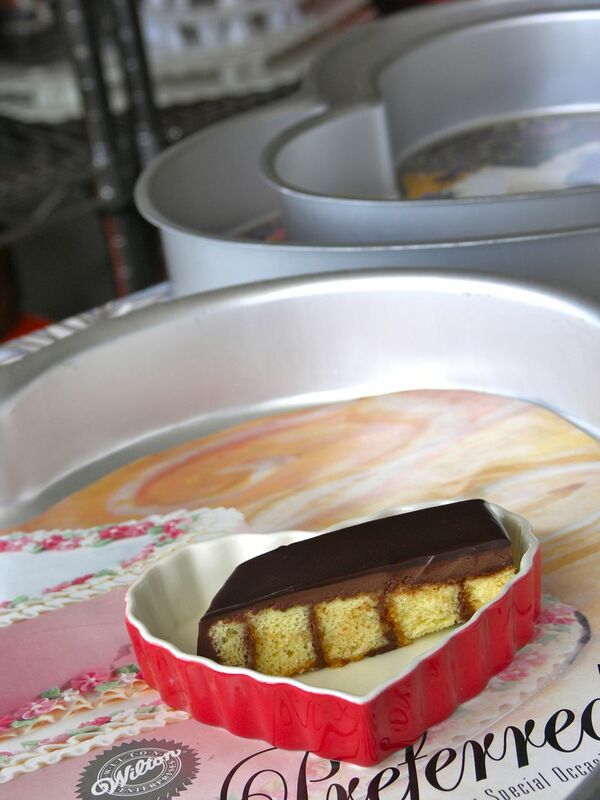 to “fill” this layer cake and resemble a cake roll, i “julienned” the cake into 1-inch strips, reattaching the strips with apricot filling and ganache. the end results resembles rose’s charlotte pattern. 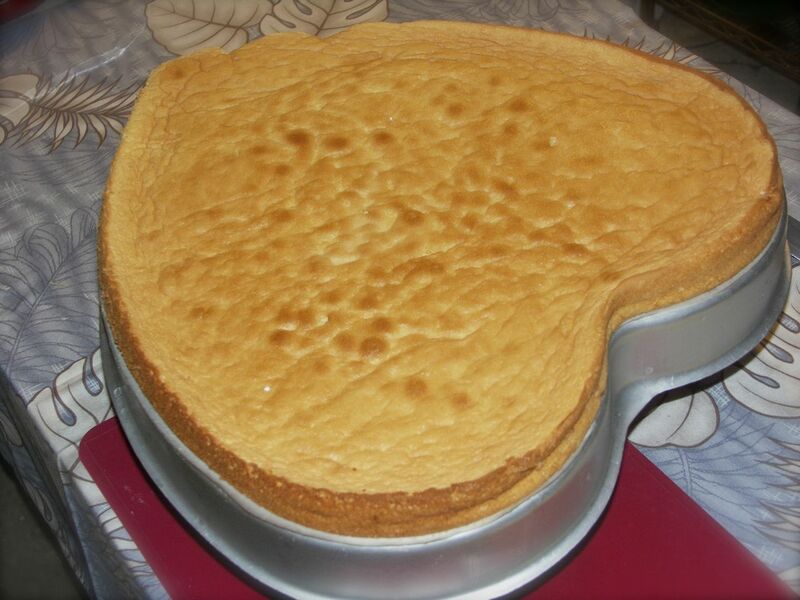 i put my heart into this cake, and indeed i didn’t expect to serve this cake after a bizarre accident. i started working on this cake on monday. then on thursday a fish injured my leg, and i was hospitalized for 2 nights. 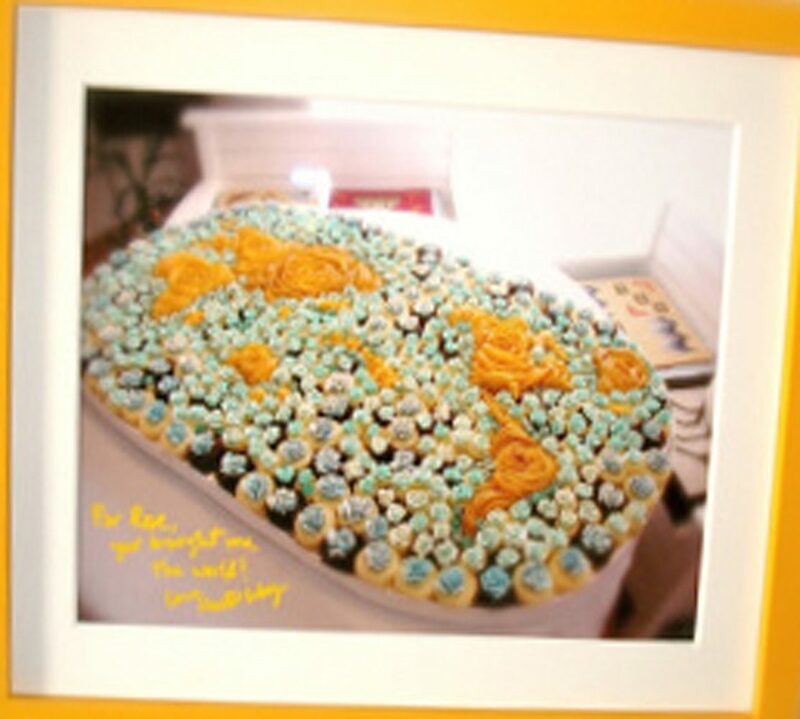 on saturday, the day of my hospital discharge, i finished this cake and brought it to Toney’s birthday. after all, i wanted Toney and all our canoe paddlers to see that life after a fish injury can remain sweet!